Clarksville, TN – Austin Peay State University women’s soccer team travels down I-24 to begin its postseason run against Southeast Missouri in the opening round of the Ohio Valley Conference Tournament, 5:30pm, Friday in Nashville at E.S. Rose Park. 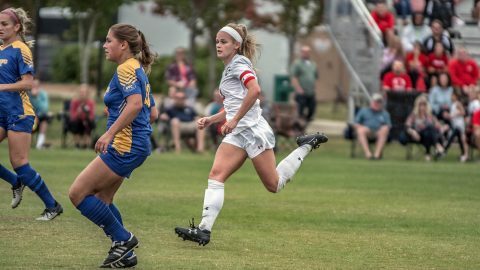 The Govs managed the must-win scenario Sunday with poise and confidence, scoring two second-half goals in the Governor victory versus Morehead State. The win secured Austin Peay the eighth seed in the OVC Tournament. Senior forward Kirstin Robertson, once again led the way, scoring the game-winner against the Eagles and providing constant pressure on the Morehead State back line. The Govs are looking for their first win in OVC Tournament play since 2013, when the Governors defeated Southeast Missouri 1-0. The Govs went 7-0-2 at Morgan Brother’s Soccer Field. It was their first unbeaten season at home in program history. Senior Kirstin Robertson had the game-winning goal to secure the Governors a spot in the OVC Tournament. Kirstin Robertson ranks 33rd in the nation in goals per game (0.65). The Govs are 4-5-1 all time in the postseason, having reached the championship game twice. Austin Peay has played Southeast Missouri more than any other team in the OVC Tournament. The Govs are 2-1-0 against the Redhawks in postseason play. The Govs earned a 1-1 draw with SEMO in the only regular season meeting in Clarksville. Robertson had the lone goal in the regular season matchup that sent the match to overtime. This is the second-straight season that Austin Peay has qualified for the OVC Tournament, the first back-to-back seasons since 2012 and 2013. Austin Peay will play in the first round Friday with the winner of Friday’s match playing in the quarter finals 2:00pm, Sunday against Belmont. The facilities at E.S. Rose Park have plenty of parking, but the area is used by various members of the community and overflow parking will be at Carter Lawrence Elementary School, a link to the directions can be found here: https://goo.gl/8jHTbi.